Day 1 Dijon arrive….Mercure Dijon (or similar) let the fun begin. Day 2 Dijon/Saint-Léger-sur-Dheune Enjoy a free morning to explore Dijon. Opt to visit the Ducal Palace, the local market or go for a mustard tasting. In the afternoon, travel to St Leger and embark the Daniele. Raise a glass to the beginning of your river adventure. 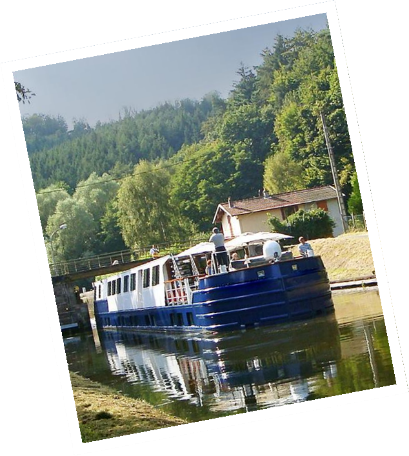 Day 3 Saint-Léger-sur-Dheune/Chagny Enjoy a quiet morning on board or opt to walk in the vineyards of Santenay and indulge in a wine tasting. Enjoy lunch on board while watching the quaint countryside go by. Continue cruising to Chagny. Explore the village and woodlands in the area. Day 4 Chagny/Chalon-sur-Saône Cycle along the Côte de Beaune, stopping at villages and vineyards along the way. Explore the vineyards of Chateau de Chassigny-Montrachet while stopping to sample some wines. This mostly flat ride is an ideal way to experience quintessential Burgundy. Day 5 Chalon-sur-Saône/Saint-Jean-de-Losne Enjoy an afternoon cruise along the picturesque Saône River toward Saint-Jean-de-Losne. Opt for a walking through the old part of town, or take free time to explore this town's quaint shops and cathedral square. Opt to enjoy dinner ashore. Day 6 Saint-Jean-de-Losne to Petit Ouges Cruise along the canal during the morning before taking a walk along the Burgundy Canal. After lunch, relax as the barge makes its way to Petit-Ouges. Opt to cycle or walk along the canal as the barge makes its way to port, or relax on the terrace while watching the riverside life unfold. Day 7 Petit-Ouges to Dijon Depart Petit Ouges for a full day cycling tour through the Côte de Nuits region along the Route des Grands Crus, lined with lovely vineyards and some of the most picturesque villages in the region. Enjoy wine tasting in the quaint village of Vougeot before meeting barge in Dijon. Day 8 Dijon After breakfast, catch the group transfer to the train station in Dijon. Tour ends on arrival.